We've added a new option for entrant numbering. 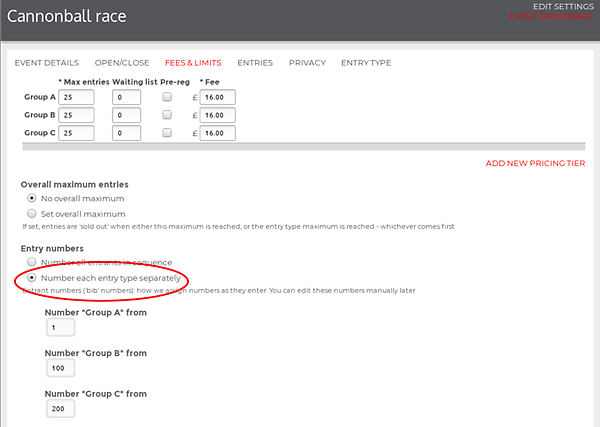 Now, if you have an event with multiple entry types (for example Adult entry and child entry, or categories AB and categories CD) you can choose whether to use separate number ranges for the different categories, or one continuous sequence across entry types. As people enter, RiderHQ will assign them a number, based on the setup you choose below. 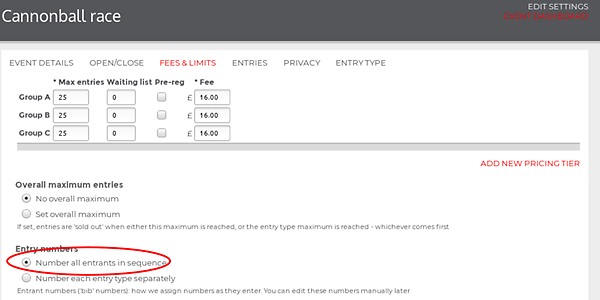 Once the number is assigned, we won't alter it, and we will assign the next number based on the maximum number already of existing entrants. Typically, you set up the numbering options when you create the event, but you can change the setup mid-way through an event and also re-number all the entrants individually or in bulk (via the custom reports or by uploading numbers or via the bulk editing feature). Often, however, you want to use separate number ranges for different entry types, so you can readily identify which entry type an entrant belongs to (for example all AB entrants might get a number between 0-99 and all CDs a number between 100-199. Hopefully this is flexible enough to cater for your numbering scheme, let us know if you not!